Two other points I want to make up front, which stand in stark contrast to the way things are done here. First there are indeed independent, publicly funded researchers able to conduct such studies. That used to be the case in Canada too. Our present government seems determined to put a stop to that, both by cutting funds for essential data collection (such as the long form census) and secondly ensuring that any publicly funded body is put under close surveillance to ensure that it toes the party line. The TUC issued a trenchant press release – but they also made the entire research report available free on line. That also seems to be exceptional here. Though I do want to acknowledge the great improvement we have seen in Translink’s data provision recently. The BC Liberals will continue to promote their own version of selling off public assets at fire sale prices, and ensuring that private corporations and their shareholders continue to profit while public services are reduced. We can expect to see a continuation of promotion of the P3 as the key to all that is worthwhile, and all kinds of manipulation to ensure that the private companies do well even when the case for a P3 cannot be supported – as with (just to pick two from many) the Port Mann Bridge or BC Place. I confidently expect that there will be yet more contracting out of public services, to ensure that workers get lower pay, “customers” get less service but shareholders and executives see increasing rewards without any risk at all. Fees and charges of all kinds will continue to be imposed on those whose real incomes are declining – all the while telling us how lucky we are to be in a free enterprise economy with “the lowest taxes”. There will be no mention at all – as is also the case with the TUC – of the damage to the environment. Cost effectiveness – train operating companies are entirely reliant upon public subsidies to run services. The top five recipients alone received almost £3bn in taxpayer support between 2007 and 2011. This allowed them to make operating profits of £504m – over 90 per cent (£466m) of which was paid to shareholders. Over 90 per cent of new investment in recent years has been financed by Network Rail (the taxpayer funded body responsible for rail infrastructure), and comes mainly from taxpayer funding or government-underwritten borrowing, says the report. Significant upgrades to infrastructure, such as the development of the West Coast Mainline, have been paid for by Network Rail. Passenger comfort – the report says while there has been a 60 per cent increase in passengers since 1994/95, there has only been a 3 per cent increase in new carriages, resulting in serious overcrowding on many routes. Innovation – even where there has been private sector investment in new technology, such as Virgin’s tilting trains, it has been underwritten by the state through subsidies to train operating companies and guarantees to rolling stock leasing companies. Added value – The Great Train Robbery shows how train operating companies paid Network Rail just £1.59bn in track access charges in 2012, compared to £3.18bn paid to its predecessor Railtrack in 1994. This represents an ‘indirect subsidy’ from taxpayers as train companies are getting track access on the cheap. It also means that the full extent of taxpayer subsidy is far greater than is often reported. Investment in infrastructure has largely been funded through borrowing by Network Rail which now has debts of over £30bn, and is spending more on repaying this debt than on railway maintenance, says the report. Competitive fares – the UK has the most expensive rail fares in Europe. Long distance, day return and season tickets are all around twice the price of similar tickets in France, Germany, Italy and Spain, which have publicly-run rail systems. Average train fares in the UK increased at three times the rate of average wages between 2008 and 2012. More passengers – the report dismisses claims that privatisation has helped increase the number of people travelling on the railways.It says that passenger growth has mostly been down to rising GDP and changes in employment patterns rather than because of privatisation. I read several UK Railways mags each month and have used trains in the UK and it is obvious that the type of privatization they have done can’t work for both the clients (passengers) and the private companies. How can any company make serious plans and projects when the franchise only last a relatively short time? It works well enough in Continental Europe with tramways because a metropole own the system (rails, trams, maintenance shops etc. ) and only use a private company to run the transit system. 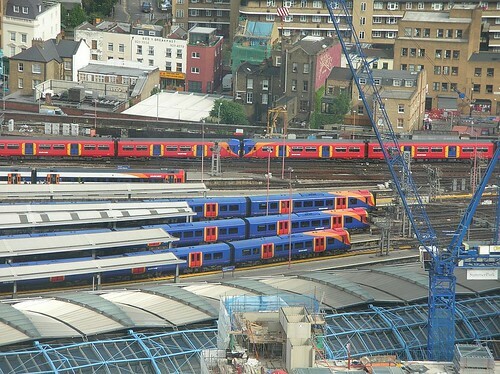 This is perhaps what the UK should do with trains. In France the regions own the regional trains and SNCF run them..and it seems to work relatively well. Unfortunately the European Union is pushing for private rail companies to run country wide trains…but then they would only bid on the most profitable lines, wouldn’t they? and who would pay for lines to sparsely populated areas? As I mentioned before, all Japanese rail companies are private, but they all have their own niche (territory) and no competition. They also use trains more as a convenience to bring shoppers to their stores, hotels, shopping malls etc. than as a money venture, though the density of the population guarantee that they at least break even..